Third Street Brewhouse, a division of Cold Spring Brewing, has launched a red ale as American as, well, the Constitution. 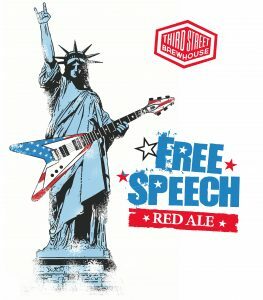 Free Speech Red Ale is designed to play well with summer, offering a powerful blend of flavors — roasty, moderately hopped and with a caramel fringe. Third Street brewers have found Free Speech to go well with barbeque, roasted vegetables and strong cheeses like sharp cheddars or feta. Along with its seasonal ales, Third Street has four popular signature brews on tap and in cans: Minnesota Gold, Hop Lift, 3 Way and Lost Brown Trout. Free Speech Red Ale was launched in mid-July under a partnership between Third Street Brewhouse and Rockin’ 101’s “Steel Toe Morning Show.” The station prides itself on being a platform for free speech and encourages listeners and beer fans to raise a glass of the red ale — to the First Amendment and individual liberty. Brewmaster Karl Schmitz reports the first week of the release exceeded expectations and, if followers continue showing overwhelming support for the draft, the Free Speech release may expand into cans and be found on liquor store shelves soon.